Royal Northern Sinfonia will be touring the region’s beautiful churches this summer with five programmes of Nordic music inspired by the Great Exhibition of the North. Following the success of its Baroque Christmas By Candlelight tour, the orchestra is leaving its home in Sage Gateshead to return to churches in Ponteland, Alnwick, Cullercoats, Darlington, Carlisle, Sunderland, Durham and Hexham, and is also excited to have added Rothbury and Corbridge to the tour. The tour, entitled Nordic Summer Nights, will run from today (Thursday) until Saturday, August 4, and will feature enchanting works by Sibelius, Nielsen and Grieg. It will include specially commissioned ensemble arrangements of Sibelius’ two best-loved symphonies Nos. 2 and 5. 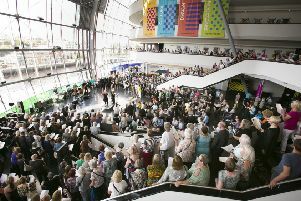 Anyone who can’t make the church performances can hear two of the programmes when the tour touches down at Sage Gateshead tonight and on August 3. The tour leads up to the orchestra’s 60th anniversary season, which begins in September and will open with Sinfonia’s Big Birthday Bash, a whole weekend of concerts showcasing different aspects of the orchestra’s work. Thorben Dittes, Director of Royal Northern Sinfonia and Classical Music Programme at Sage Gateshead, said: “These tours are so important to the orchestra, as we take our music out of our home venue to reach people who don’t usually come and hear us perform at Sage Gateshead.